The wonderful team at SOHO Coffee Co St Pauls were happy to pose for this photo, showing off their UK Coffee Week supporter badges! Smiles all round ladies! We hope you didn’t miss out on the chance to grab a coffee, do something good and have a delicious crepe all at the same time?.Our new supporters Crêpeaffaire donated 5p from every coffee sold! Combining coffee and cake is a sure fire win to bring some funds in! Aromas Artisan Coffee created this divine Coffee and Cardamom Cake to celebrate and raise some money for Project Waterfall. Long-standing UK Coffee Week supporters Abokado highlighted their “Feel Great” ethic with a customer donation competiton to win free coffee for a week. Bison Coffee up in York were well prepared for the fantastic weather that graced UK Coffee Week! Iced lattes for all. Representing in sites across Northern Ireland, first time supporters Ground Espresso got the marketing materials matching the bright sunshine, bringing out the smiles! Caffe Isola on the Isle of Wight put their cocktail flags to good use and highlighted their amazing cake offering during the week! Who could resist? Up in Hertford, Cinnabar staff knew the best way to entice a customer to chat about UK Coffee Week was to make a beautiful display using all the marketing materials! Costa Coffee has long been a supporter of UK Coffee Week, with 2018 being no different. 20p from their Character Roast, a single origin Peruvian coffee, has been donated to Project Waterfall, used to aid clean water and sanitation facilities in partnership with The Costa Foundation. Up in Newcastle, Pumphrey’s Coffee hosted a guess the beans competition, with one of their regular customers winning 8 free coffees with his closest guess! It must’ve taken hours to count those beans! With a truly unique fundraising mechanism, Second Cup locations promoted their very own UK Coffee Week/Second Cup Snapchat filter, spreading the word on social media and donating 50p every time it was used! Gelato and coffee specialists Brü put their materials to great aesthetic use, hanging their bunting up around their wonderfully designed lights. Looking good Bru! We love when staff such as the friendly team at WOOF Coffee use the smile cards to have a bit of fun promoting UK Coffee Week! Anyone for a funky moustache? Combining the UK Coffee Week brand into their own cake design, Stacks Coffee House and Bistro created their own fondant cake toppers just to celebrate the week! The Swellies in Y Felinheli ran their own raffle using the French Press generously donated by Bodum to each UK Coffee Week participating store, alongside other goodies to be won! Taking part in multiple locations around Sheffield and South Yorkshire, True North Brew Co. put their designers to work to create this promotion for UK Coffee Week and Project Waterfall. We completely agree with their sentiment! Over 30 sites from the awesome Harris + Hoole took part in UK Coffee Week this year, with fantastic team spirit to clebrate and raise funds throughout the week. This photo of the Burgess Hill team perfectly demonstrates the best use of the Smile cards! Proving that UK Coffee Week isn’t just for coffee shops, The Common Room in Sheffield promoted their Espresso Martinis over the week, with 20p donated to Project Waterfall from each drink. 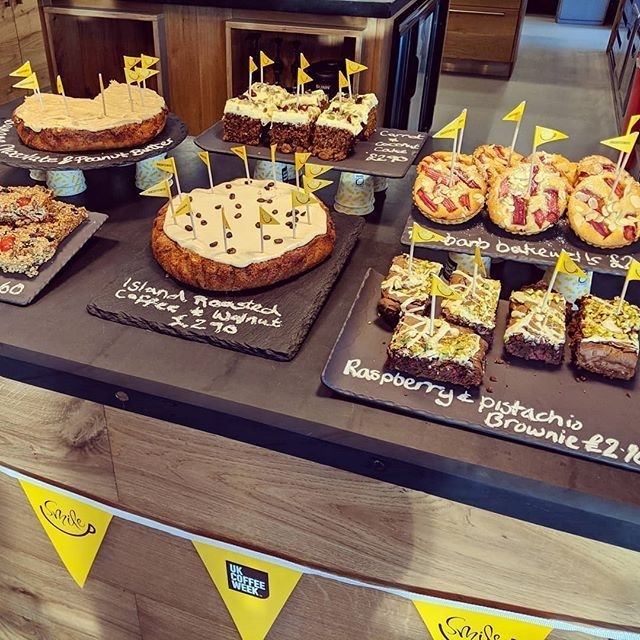 Popular across Europe, the UK branches of Campanile got their fundraising hats on during UK Coffee Week, go all out to decorate their coffee and breakfast areas in celebration. The ever so chic Parcafe, a part of The Dorchester Hotel on Park Lane, were already in the spirit of UK Coffee Week with their bright yellow La Marzocco! Could this machine catch on with other coffee shops…? The UK Coffee Week partnership with Caffe Nero is one we are very proud of. 20p from every Caffe Nero Flat White is donated to Project Waterfall to help support the work in Nero Foundation coffee communities. Putting the fun back in fundraising, the team at JACS Coffee in Amersham stepped up their game by challenging their customers to reach £500 in donations, and the boss would shave his beard. Guess what…they did it! Bringing a Smile through every cup is exactly what UK Coffee Week is all about, so imagine our excitement when we saw the bottom of the Muffin Break mugs! The team at Esquires know that putting information about UK Coffee Week on every table helps customers understand the campaign, and how they are helping through Great Coffee and Goodwill.